One of Britain's most famous and longest serving rulers, Queen Victoria saw widespread change across the planet. During her sixty-three-year reign, in which she became one of the most powerful and influential people in the world, Victoria met everyone from Charlotte Bronte to Buffalo Bill; she had opinions on all those who graced her parlour - and some who didn't. 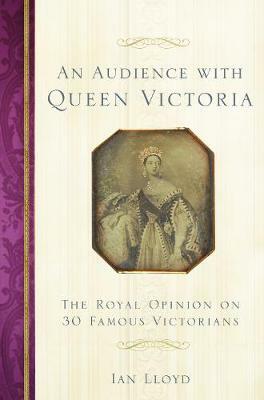 An Audience With Queen Victoria examines the meetings and letters exchanged between the queen and a veritable who's who of her time. It draws on often brutal character assessments in her journals and letters - Henry 'Dr Livingstone I presume' Stanley was 'a determined ugly little Man'. Exploring those she met officially and personally - even the seven men who tried to assassinate her - and her thoughts on figures of the time such as Jack the Ripper, Ian Lloyd unlocks a fascinating aspect of Victoria's character and outlook. Through brand-new archival research, newspapers and interviews with descendants, sit alongside Victoria and experience queenship as she did for the first time. IAN LLOYD has spent twenty years as a full-time writer and photographer, specialising in the British Royal Family. He has had two books in the Sunday Times bestseller list (both 2011) and writes regular features for the Daily Mail, Mail on Sunday, Hello Magazine and Majesty Magazine. Ian is also the Royal Correspondent for The Sunday Post and a regular royal pundit on Sky News, BBC News and BBC Radio 5 Live. He lives in Oxford.